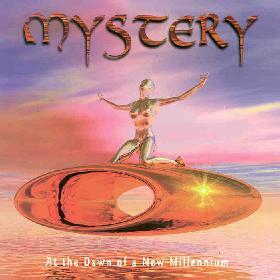 Mystery - "At The Dawn Of A New Millennium"
First formed in 1986 by Unicorn Records label head Michel St-Pére, Mystery has released three albums to date, At The Dawn Of A New Millennium being a compilation of tracks from those recordings. Not much to say really. This totally brings back memories of late 70's accessible AOR bands like Journey, Kansas, and Styx, albeit with some progressive rock tendencies. Journey is the strongest influence due to vocalist Gary Savoie being a dead ringer for Steve Perry. The music is well composed, crafted, and played, but I'd say most Aural Innovations readers would find this a bit too mainstream and fluffy for their tastes. "Black Roses" is the one track that stood out for me, having a bit more variety to it, including a brief but killer guitar solo and some really nice flute passages. Prog rockers who like really melodic songs that also rock out a bit would like Mystery. At the Dawn Of A New Millennium is distributed by Unicorn Records. You can visit their web site at: http://www.unicornrecords.com. Hear sound samples at the Mystery Mp3.com web site at: http://www.mp3.com/mystery.